Belmont Stakes (gr. I) winner Colonial Affair died on the morning of April 23 at Haras El Paraiso in the Buenos Aires province of Argentina. The 23-year-old son of Pleasant Colony—Snuggle, by Nijinsky II, was shipped to Haras El Paraiso in 2003. He was previously retired from stallion duty. Owners Pablo and Victoria Duggan reported in an e-mail message that Colonial Affair was found dead in his paddock, possibly of a heart attack or some other infirmity of old age. The owners said the stallion would be buried at their horse cemetery. “It was a honor for us to be able to stand such a good horse at our farm,” they wrote. Colonial Affair helped Julie Krone make history in 1993 by becoming the first female jockey to win the Belmont Stakes (gr. I) and first to win any of the Triple Crown races. He won three other graded stakes—the Jockey Club Gold Cup (gr. I), Whitney Handicap (gr. I), and the Excelsior Handicap (gr. II)—all in 1994. Out of 20 career starts, Colonial Affair won seven times and placed in another seven races. His career earnings totaled $1,635,228. 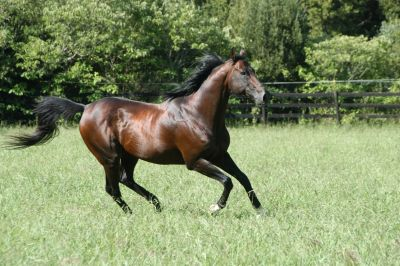 He has sired 15 U.S. stakes winners and 20 worldwide, including the Argentine group I winner Cafrune, who was bred by El Paraiso and has won 15 stakes to date. © 2019 Centennial Farms. All rights reserved.